Kuroyanagi Tetsuko learns that NHK has put out a call for exclusive actors for the start of television broadcasting and takes the entrance exam. She keeps failing the exam, but somehow passed. Tetsuko appears on radio and television programmes as an extra, but keeps getting admonished for being too conspicuous. She is told by the floor director Ijuin, who entered NHK at the same time as she did, that her individuality gets in the way. Then, a turning point comes. Tetsuko auditions for a new radio drama and playwright Iizawa Tadasu, who is serving as a judge, makes an unexpected comment to Tetsuko. He selects her for the leading role in �eYanbo Ninbo Tonbo�f, giving her great confidence. She goes on become NHK�fs first television actress in 1953 (Showa 28), which was the start of television broadcasting. She has brought laughter and tears to TV viewers and many people have supported her since the beginning of the television age when dramas were live until today. 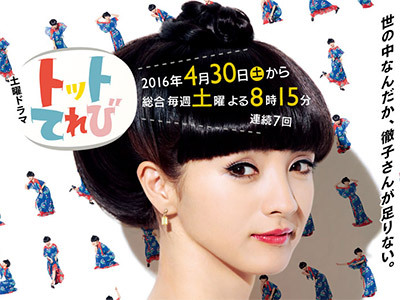 Good, short drama about Japanese TV icon Tetsuko Kuroyanagi. (That old lady at the beginning and end of each episode is the real Tetsuko Kuroyanagi). Great work by Mitsushima as usual.